Sometimes, when teaching kids how to make letters, it is helpful to add creative and different methods to the good old fashioned, paper and pencil letter making practice. This Push Pin Letter Formation activity is a creative way to practice correct letter formation using a resistive surface for a proprioceptive input to handwriting. We're back with today's post in our month-long Learning with Free Materials series, part of the 31 Days of Homeschooling Tips as we blog along with other bloggers with learning at home tips and tools. We've used push pins in creative learning not too long ago, so pulling the push pins again turned out to be a big hit with my son. He loved using them in our color math counting activity, so when I pulled them out of the drawer, he was excited to try this letter formation activity. In our Learning with Free Materials series this month, we're using items from around the house in learning. Push pins are perfect tool for learning, because most people have them on hand, and if not, they are on the cheaper side to purchase. 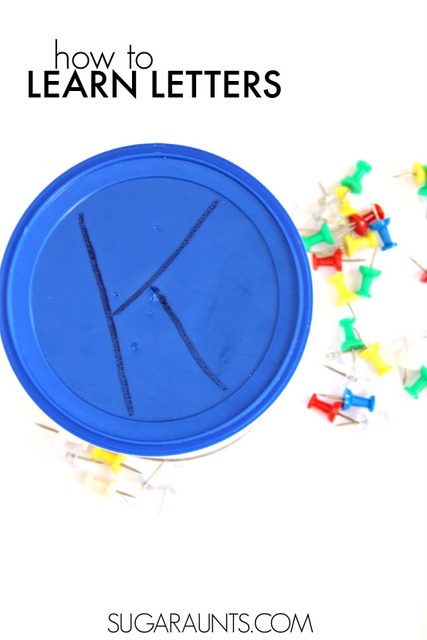 To do this letter learning activity, you'll need a can with a plastic lid. An oatmeal, raisins, chips, or any canister-type container with a plastic lid would work. You'll want a lid that can be perforated by the push pin and can be written on with a dry erase marker . Draw any letter on the lid with a dry erase marker . 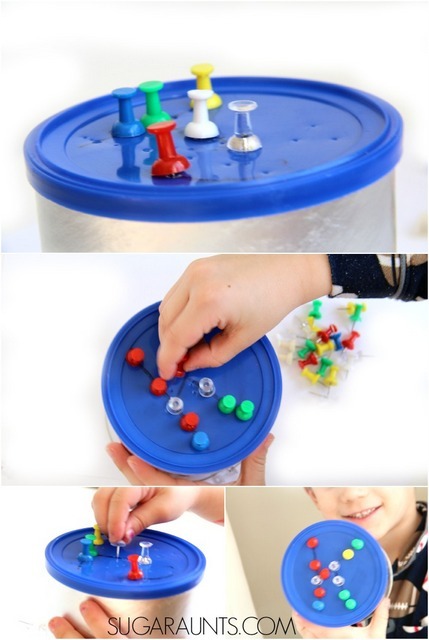 Instruct your child to push the push pins through the lid along the lines in the correct formation. Be sure to provide verbal and visual cues as needed so your child forms the letter with the push pins correctly. So, for a letter "K", your child should start at the top of the letter and push the push pins along the lines, going strait down. Then, they will use push pins to form the slanted parts, beginning at the top and sliding in toward the strait line, then slanting outward to the bottom of the letter. Using the resistive surface with the push pins is a great way to encourage a tripod grasp, which is so important in pencil control and handwriting. The resistive surface of the lid provides great proprioceptive input during letter learning and handwriting. After you've formed a letter, simply use a paper towel to erase the letter and start all over with a new letter. NOTE: As always, provide supervision to your child with this and any activity that you see on our blog. Use your judgement when doing this activity with your child.